Who doesn’t listen to music? Who doesn’t get carried away by the beats and sway to the melodies? Music is that art that connects souls using sound and silence in ways that you sometimes can’t even imagine. It simply changes your perception of space and time in an instant. Nowadays we have so many different formats to create and transport music files across devices. MIDI – Musical Instrument Digital Interface – is the standard that defines a protocol, a digital interface and connectors. It allows a variety of electronic musical instruments, computers and other devices to connect and communicate with each other. MIDI can form a link to transmit up to 16 channels of information, each of a separate device. First of all, let's try and understand what MIDI is not: It's, not music. It doesn’t contain any sounds. And it is not a file format. MIDI is a set of instructions that operate on data. It has events and messages that tell your device how to generate the sound you want to hear. MIDI is compact, easy to modify and can offer its services to a host of different instruments with the same instructions. Here is a website that will convert your Mp3 files into a portable MIDI file online. And it’s absolutely free. There really isn’t much to say about Bear File Converter. You upload the file you want to convert, and the site does the rest for you. It’s that simple. And the file generated is small in size. Another advantage! This software comes with the feature of converting your MP3 file to many different formats, not limited to MIDI. It comes with an easy to use interface and supports plenty of file types. You can easily extract the sounds you want from files and convert audio in batches! It is a freeware software that allows the conversion of audio formats into MIDI. Reviews have shown that it produces excellent results and provides extensive help documents to assist you. However, to use this efficiently, you need to have enough background knowledge about music and its technical sections. It is your one stop destination to convert any audio file into MIDI. An absolutely cool feature integrated into this is that you can also compose MIDI by singing or playing a musical instrument! Intelliscore helps you figure out notes from your file quickly. It has an enhanced visual pitch indicator that lets you tune instruments. Backed up with free technical support. It helps remove vocals to create karaoke music and records MIDI directly into a sequencer using voice or a musical instrument. You won’t want to give Intelliscore a miss. Audacity can always be counted as your number one choice when you want to convert an audio file into any other format. 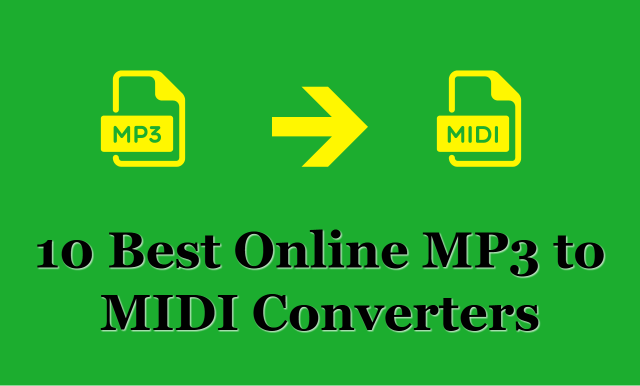 If you want to convert your MP3 to MIDI, you need not look any further. Besides MIDI, you can also use Audacity to convert M4A to MP3. It is another excellent audio converter to convert MP3 to MIDI with ease. The interface is clean. It is user-friendly, and it is simple to understand and use. This converter explains what is happening to your audio file as it converts it to MIDI. Files as big as 50 MB can be uploaded here. AmazingMIDI by design records music and converts MP3 files into MIDI files. It recognizes artificially produced music and is a powerful tool to help you transcribe music, make MIDI files and so on. Even if your music file contains various instruments, AmazingMIDI detected all the notes as a single music instrument and analyzed it as such. It is freeware and can be copied as long as you don’t make any unauthorized changes to it. Simply download it and run the installer. It is a software that can be used to convert you MP3 into MIDI quickly. Its interface is simple and you, can batch convert many audio files to MIDI. With its easy interface, all you need to do is add files you need to convert, and Converter Lite does the job for you. It is fast, efficient and allows encoding and compressing of files. Converter Lite is free software that works exclusively on Windows. It uses the FFmpef project to convert audio quickly. One feature that makes it very attractive is that it can be used in multiple languages. It is software that is used to save your popular audio format files in MIDI form. The program is interesting in its process of conversion. It uses sound fonts and performs a lot faster than most other converters. The program allows for batch processing, and it is possible to just drag your desired files for conversion. It is different software that converts your MP3 files into MIDI files and displays those saved files as sheet music on your screen so that you can view the notes as they play. You can change the tempo and bars. You can edit the misc for karaoke. It allows you to add notes and change pitch according to your preference. One unusual feature is that Notation Player allows you to share your music with other musicians in XML format. You are also able to create new music from scratch using this player!